Some historical investigations and opinions. As a history undergrad, I often get asked a number of specific questions. 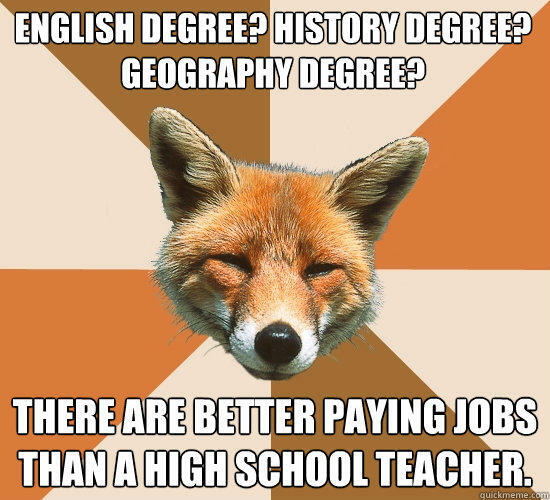 For instance, ‘why are you studying history?‘…’do you want to be a history teacher?‘ or ‘what can you actually do with a history degree?‘. Did you know past prime minister Gordon Brown graduated with a first class honours degree in history. Likewise, Sir Alec Douglas-Home also graduated with a degree in modern history from Oxford university as did Clement Attlee, labour leader and creator of the National Healthcare Service. The Telegraph published an article in 2012 titled ‘The best lawyers are not law graduates, claims judge’. Th e article states ‘aspiring lawyers would be better taking degrees in history or mathematics before moving on to study law’ and then goes onto point out that Lord Sumption, 68, obtained a history degree from Oxford in 1970 before qualifying as a barrister in 1975. The article helps to highlight how the study of history ‘is at least as valuable a preparation for legal practice as the study of law’, that history or at least a subject such as Mathematics which requires ‘pure logic’ also helps to cultivate an understanding of the ‘social or business background to legal problems’. I like how this article approaches this issue and helps to put some of the stereotypes surrounding history degrees to bed. I plan to do the same by showing just how diverse and essential the degree actually is. I won’t lie and say having to remember and retain large amounts of information concerning the stages of the French revolution, the impact of the civil rights movement or other general detail relating to historical events is fun. Yet, there are aspects of a history degree that does prove to be quite rewarding such as learning interesting facts that you didn’t know or being able to hold your own in a political debate due to your vast knowledge. Such aspects are often overlooked by certain pitfalls being revising for an exam and not learning for life or retaining information that seems to have no use for the future. It is easy to think that the information we retain is not useful for the immediate future. However, it is our knowledge of the past that informs the future. For instance, it is our knowledge of the ‘boom and bust cycle’ and ultimately the recession under Gordon Brown that shapes UK and global economic policy. If someone enters the ocean with no knowledge that they can drown, it is this knowledge that will force them to take swimming lessons before doing so again. That being said, past events in history certainly help to shape the manifesto’s and future policies of government. Similarly, our knowledge of political activism such as the Russian revolution teaches government about what it needs to do to placate the people and avoid a social upheaval in the future. So although, what the degree teaches may have no direct relevance to the future, the details regarding the past provide invaluable lessons for the future. I also believe that history repeats itself and that is why people can make comparisons between Hitler’s style of rule and Donald Trump’s administration. Absurd as some of these comparisons may be it creates interesting and intellectual discussions amongst young and old members of society. We see the benefits of subjects such as history in the results of the recent UK election and statistics which show that 72% of youth aged 18-24 voted in the election. Additionally, because history does in fact repeat itself it leads to healthy discussions such as ‘how can we combat racism?’ and discussions pertaining to why it continues to remain evident in society despite the end of slavery. These discussions allow us to evaluate ourselves as human beings and look towards a better and more ‘equal’ future. Then when these issues relating to dictatorship, power or racism are openly tackled in TV shows such as House of Cards or films such as Get Out, it shows society’s ability to move forward. Finally, there is nothing that doesn’t have a history or past which means you can actually study the history of everything and anything really. During my term-time internship, I actually remember one of my lecturers telling me that they were conducting a case study on the history of chickens. Not gonna lie but I laughed at first. Initially it seemed absurd and quite frankly I really just wanted to say “Bro, I don’t think anyone cares”. Although, when he actually explained the ins and outs of it, it actually made sense! Obviously chicken is a staple source of food, like it is an EXTREMELY important aspect of the food chain…like this is undeniable, chicken is great. All my friends are going vegan actually so you probably won’t be seeing an exposé on how much I love chicken. Well not anytime soon at least. Anyway, I digress. Because we consume it so regularly it makes sense why a case study on the history of chickens would help to truly understand what is going inside our bodies. So, I’m pretty sure you get my point. Anything can be studied at length, even the history of Beyonce if you will…wait, I think they already have a course for that.